Gershwin Theatre is one of the biggest and most well known theatre venues in New York City. This theatre is known for staging iconic shows, such as Show Boat, Porgy and Bess, My Fair Lady, and Sweeney Todd. 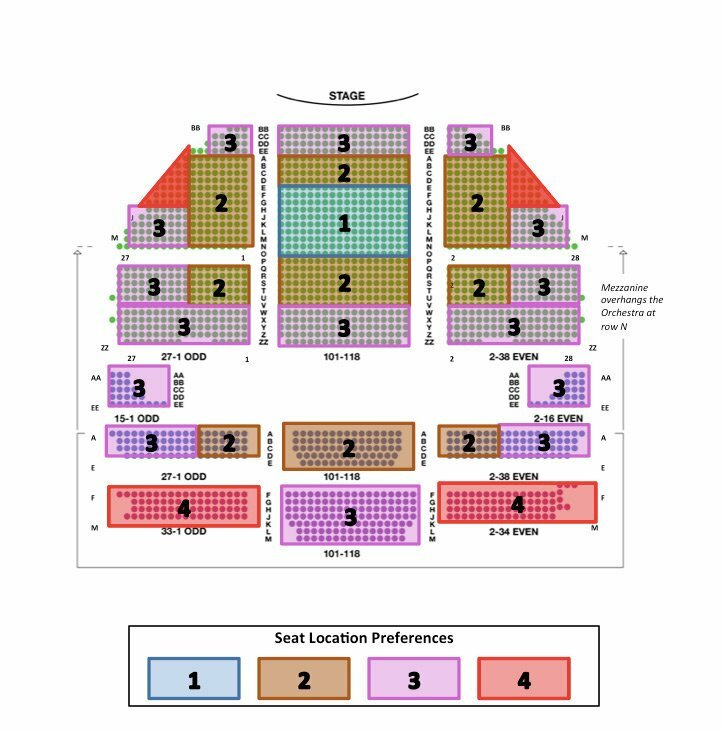 When considering buying tickets to see a show, it is important to realize that the Gershwin Theatre seating chart does not lend itself to providing the best views for everyone. So when looking to buy tickets for current running show Wicked, finding the best seats for the best price can be difficult. In this post, I will tell you which seats are the best and which are the worst. I’ll also tell you how to find the best deals and cheapest Wicked tickets. The higher the seat number the closer you are to the side, thus increasing the likelihood of having an obstructed view. See our obstructed view section above for more information about exactly where to sit and which seats to avoid in the side orchestra section. Tip: I would prefer to sit one row further back in exchange for a seat that is one seat closer to the inside aisle (i.e. I would prefer seat 15 in Row O, verse seat 17 in row N). Orchestra Left (Odd Number Side): In this partially obstructed view seating, the only part of the production of Wicked you will not be able to see is a metal dragon that hangs on the top of the stage, a prop only used shortly at the beginning of the show. There is a possibility you may not be able to see the backdrop and part of the farmhouse, but for the most part, the images projected there aren’t the even a significant part of the show. Orchestra Right (Even Number Side): If you’re going to purchase partially obstructed seats, my recommendation would be Orchestra Right (Even Side) above row G. With these seats, you won’t miss a thing. In terms of price, you probably won’t find a better deal on Wicked Tickets than the partially obstructed view seats. When buying tickets directly from the NY box office your seat numbers will often be numbered. But for privacy purposes, tickets reselling on sites like stubhub, don’t have to state their seat numbers (only row and section). For this reason, I don’t recomend buying tickets in the Orchestra Right or Orchestra Left for Rows BB-G on secondary ticket marketplaces (ticketmaster and telecharge are okay). Here, you would run the risk of purchasing tickets with very obstructed views, taking away from the experience of seeing what’s up on stage. If the prices seem too good to be true, they probably are. If you read the previous section, then you discovered the risk of sitting in the first few rows of Orchestra Left and Orchestra Right, and how these seats could turn up a sub-par theatre experience. This likely leads to the question, why are the closest seats in the Center Orchestra not the most desirable? These are raised stages. The first few rows are close to the stage, but not necessarily in a good position to see what is up on stage, much like the experience at a movie theatre when you have to sit in the first few rows. The action doesn’t take place at eye level when you’re in the first few rows of the Orchestra, Rows BB, CC, DD, EE, and you’ll probably end up with a stiff neck. Even up to Row E in Orchestra Center is closer than what is consider ideal seats for Wicked. With that said, the best seats are Orchestra Center rows F to L.
Gershwin Theatre Obstructed View Seats – The Cheapest Wicked Tickets? If you’re looking for the cheapest Wicked Tickets, partially obstructed seats will be your best bet (more information on this below). You can also check out this blog on rush tickets, which offers advice on how to get rush tickets as well as lottery tickets for Book of Mormon. Although written specifically for BOM, the information applies to getting Rush tickets for Wicked and other Broadway shows in NY as well. There are a limited number of Side Orchestra seats that are considered to have partially limited-views. 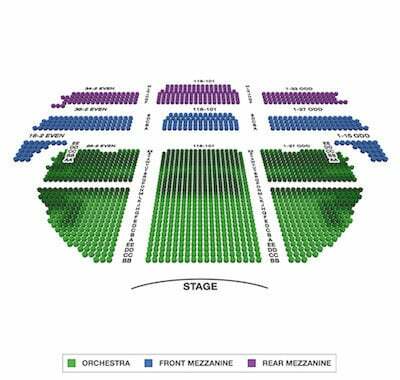 The obstructed seats are the red triangles not labeled with a number in the seating chart above. In the these sections you may lose sight of the performers during some of Wicked. The key to getting decent seats at a decent price is by buying tickets that are marked obstructed view, yet are above row G. When sitting above row G, you’ll lose part of the scenic background, but very limited action occurs on the far sides of the stage. Loge Row AA overhangs orchestra Row J. These facts, along with a many others unstated, combine to make choosing your seat at Gershwin Theatre a dangerous gamble. The Overhangs at Gershwin Theatre aren’t particularly large considering the size of the Theatre. This means that nobody’s view is obstructed by the section above them, which is great for keeping an eye on the high flying acrobatics of Wicked. The mezzanines are not stacked too tightly, which is nice, but this also means that the rear mezzanine is considerable far away from the stage. In fact, some people have reported it to be difficult to see from the back of the rear mezzanine. Fortunately, theatres tend to be intimate compared to concert and sports venues, so we can disregard many of these complaints and those alike. If you don’t need to see the moles on the Wicked Witch’s face, rear mezzanine seats should be more than fine. Seats in the Mezzanine as well as the Rear Mezzanine are not obstructed view for the most part. New York theaters, including Gershwin Theatre, are small enough that even the ‘nosebleed’ seats are close to the performers for consistent acoustics and good sight lines. A concern should only be raised when considering tickets at the far extreme corners of the rear mezzanine because some of these seats may be partially obstructed. The good news is that if it is, they will labelled that way. 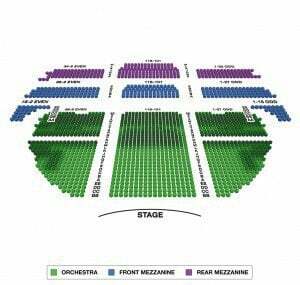 I think it is important to note that even though the Gershwin Theatre seating chart shows that there’s a break in the front mezzanine from the rear mezzanine, there’s virtually no break. I wouldn’t value the front mezz much more than the rear mezz (particularly if you are on a budget). “one of the best theatres on broadway!! very big with the most comfortable seats ever and sooo much leg room!! beautiful lobby and so very cool how they have the theatre hall of fame in the theatre. sat in 6th row center orchestra, excellent, excellent, excellent seats. wonderful to be so close to the stage, and although it was a premium seat, wasn’t as expensive as a lot of other shows on broadway. The Gershwin Theatre’s lottery policy shifts from show to show. Unfortunately, at the moment, Wicked does not have a lottery set up. Tickets must be purchased outright. And if you get a chance to take a picture of your seats and from your seats, drag and drop ’em in the comments section below so we can update this review to help people find great seats in the future.